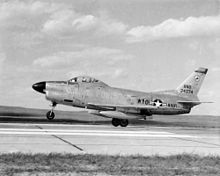 The North American F-86D Sabre (sometimes called the "Sabre Dog" or "Dog Sabre"[not verified in body]) was a transonic jet all-weather interceptor of the United States Air Force and others. Based on the North American F-86 Sabre day fighter, the F-86D had only 25 percent commonality with other Sabre variants, with a larger fuselage, larger afterburner engine, and a distinctive nose radome. The fuselage was wider and the airframe length increased to 40 ft 4 in (12.3 m), with a clamshell canopy, enlarged tail surfaces and AN/APG-36 all-weather radar fitted in a radome in the nose, above the intake. Later models of the F-86D received an uprated J-47-GE-33 engine rated at 5,550 lbf (24.7 kN) (from the F-86D-45 production blocks onward). A total of 2,504 D-models were built. On 18 November 1952, F-86D 51-2945 set a speed record of 698.505 mph (1,124.1 km/h). Captain J. Slade Nash flew over a three km (1.8 mi.) course at the Salton Sea in southern California at a height of only 125 ft (38 m). Another F-86D broke this world record on 16 July 1953, when Lieutenant Colonel William F. Barns, flying F-86D 51-6145 in the same path of the previous flight, achieved 715.697 mph (1,151.8 km/h). A Wyoming Air National Guard F-86L in the late 1950s. Production interceptor originally designated F-95A, 2,504 built. Provisional designation for F-86D variant with uprated engine and equipment changes, 406 built as F-86Ds. 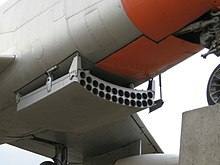 Basic version of F-86D intended for export with rocket tray replaced by four 20 mm cannon and simplified fire control system, two conversions. NATO version of F-86D; MG-4 fire control system; four 20 mm M24A1 cannon with 132 rounds per gun; APG-37 radar. 120 were built by North American, 221 were assembled by Fiat. Upgrade conversion of F-86D with new electronics, extended wingtips and wing leading edges, revised cockpit layout, and uprated engine; 981 converted. A West German Air Force F-86K in 1965. North American F-86K from Royal Norwegian Air Force. F-86D of the Philippine Air Force. Received 59 ex-USAF F-86Ds 1958-1960; assigned to 723, 726 and 728 Squadrons. Fiat built 62 F-86Ks for France (1956-1957), assigned to EC 1/13 "Artois", EC 2/13 "Alpes", and EC 3/13 "Auvergne" Squadrons. Serials were 55-4814/4844, 55-4846/4865, 55-4872/4874, 55-4876/4879. Acquired 88 U.S. F-86Ks 22 July 1957–23 June 1958. The Ks were assigned to Jagdgeschwader 75/renamed 74. Acquired 35 F-86Ds from the US. Were received in 1961 and retired in 1967 but kept as back up until 1969. F-86D was the first all weather fighter in Greek Air Force. F-86Ds were assigned to 337 & 343 Squadrons. Until 1964 they were in natural metal. Until after retirement they were in NATO camo. Acquired Six Venezuelan F-86Ks in 1970. Fiat produced 121 F-86Ks for Italy, 1955-1958. Also, 120 U.S. F-86Ks were acquired. F-86s were assigned to the AMI air groups: 6 Gruppo COT/1 Stormo, 17 Gruppo/1 Stormo, 23 Gruppo/1 Stormo, 21 Gruppo/51 Aerobrigata, 22 Gruppo/51 Aerobrigata and 12 Gruppo/4 Aerobrigata. Acquired 122 US F-86Ds, 1958–1961; assigned to four all-weather interceptor Hikōtai, and Air Proving Ground at Gifu. Acquired 57 U.S.-built and six Fiat-built F-86K Sabres, 1955–1956; and assigned to three squadrons, No. 700, 701 and 702. Operated until 1964. Acquired 60 U.S.-built F-86K Sabres, 1955–1956, and four Italian-assembled Fiat K-models. Acquired 20 F-86Ds, assigned to 8th Fighter Interceptor Squadron "Vampires" beginning 1960; part of the U.S. military assistance package. Acquired 40 F-86Ds, beginning 20 June 1955. Acquired 32 US-built F-86Fs, October 1955–December 1960; 1965 acquired 79 Fiat-built F-86Ks from West Germany. Acquired 130 U.S.-made F-86Ds and operated them between 1961 and 1974. ^ Wilson 2000, p. 111. ^ Angelucci and Bowers 1987, pp. 346–347. Dorr, Robert F. F-86 Sabre Jet: History of the Sabre and FJ Fury. St. Paul, Minnesota: Motorbooks International Publishers, 1993. ISBN 0-87938-748-3. Robinson, Robbie. NATO F-86D/K Sabre Dogs. Le Havre, 2018, 120 p. ISBN 978-2-9541818-3-7. Wikimedia Commons has media related to F-86D/K/L Sabre Squadron Emblems. 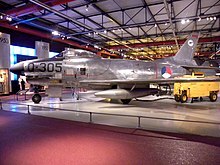 Wikimedia Commons has media related to North American F-86D/K/L Sabre. This page was last edited on 9 February 2019, at 10:24 (UTC).